The Ford Ranger is a new midsize pickup truck that features many of the technology features previously only found in cars. The Ranger’s technology, along with its performance, design and spacious interior, may be why pickup trucks are now being called the new family vehicle. If you’d like to learn more, pay us a visit at Fremont Ford. 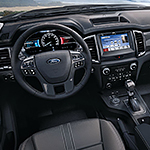 The Ford Ranger is loaded with technology to make driving fun and easy. From the FordPass Connect™ and Ford Co-Pilot 360™ to the SYNC® 3 compatibility, there is very little you can’t do while driving the Ford Ranger. Voice activation allows you to drive safely while getting driver assistance and still doing your favorite things on your electronic devices. If you’re ready to get that new pickup, you really should check out the Ranger and see why it’s so popular. Come to the dealership and take the new Ford Ranger out for a test drive.